Minkyu Kim etched his name into the record books as the youngest winner in European Tour and European Challenge Tour history by winning the D+D REAL Czech Challenge in stunning fashion. 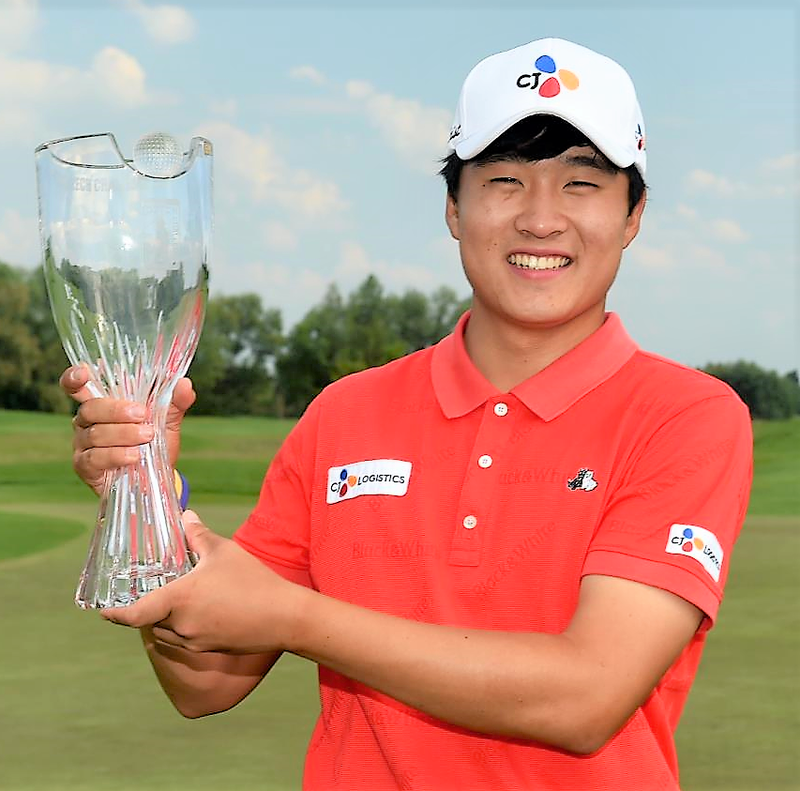 At 17 years and 64 days, the South Korean has eclipsed the previous mark of 17 years and 188 days set by Italy’s Matteo Manassero at the European Tour’s 2010 Castello Masters. On the Challenge Tour, Kim betters Dominic Foos’ record by 283 days as the new youngest-ever champion on tour. The South Korean, who started the day with a two-shot lead before faltering early, was able to settle himself, and after picking up shots on the seventh and ninth, he made the turn only one stroke behind Sweden’s Sebastian Soderberg. Kim would then put on a show — taking just 30 shots to complete his back nine, wKihich included six birdies and no bogeys, to fly past Soderberg and claim a three-shot victory on 20 under par 268. The South Korean teenager earned 29,600 Euros for his win. Soerberg earned 20,350 Euros. The crowds at Golf and Spa Kunětická Hora grew quickly, and after finding the putting surface with his approach into the 18th, the young South Korean was able to enjoy his walk to the green. Afterwards, the teenager reflected on a week, and a final nine, that will live long in his memory. “I feel really happy,” said Kim. “It’s a dream. I was really nervous this morning before the round and on the first few holes, but then I made a double-bogey on six and I just wanted to get a top-three. “I was crazy over the back nine. My driver was really good, I hit such good iron shots and my putter was really good too. I was just crazy. With victory Kim becomes only the second golfer from South Korea to win on the Challenge Tour — following Byeong Hun An who triumphed at the 2014 Rolex Trophy — and moves up 109 places on the Road to Ras Al Khaimah to now sit in 12th position. Austria’s Matthias Schwab carded the low round of the week on Day Four as he made eight birdies and no bogeys to sign for a 64. The Challenge Tour now travels to Switzerland for the Swiss Challenge presented by Association Suisse at Golf Sempachersee in Lucerne.